I'm working on a long-term project. I won't start in earnest until the after-Christmas sales, but we'll say it involves a Halloween costume pattern and fabric. 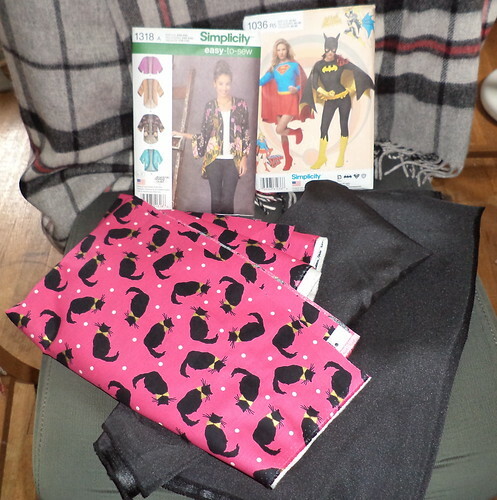 As Halloween patterns are on sale right now PLUS I had coupons, I entered JoAnn Fabrics last Sunday with the blinders on to get one pattern and one pattern only. The cat print was on the end of a row of splashy Halloween fabric. The way this particular store is laid out, you're going to see brightly colored, distinctive fabrics when you walk in. In the store where I take my stuff to be framed, I would not have seen this, but I wasn't going all the way up there for a pattern, when I knew my local JoAnn's would have it. I resisted for about 10 minutes. I actually had to pull up the costume pattern and look at it, to make sure it will do what I need to have done. And then I started paging through the Simplicity book, looking at shirts. I have an ancient camp shirt pattern which I've used for a wide variety of shirts, but I had no idea how much material it took and there was nothing like it in any of the books. There was one shirt I liked mainly because of the location of the pockets. But the variation I really wanted, long torso and elbow-length sleeves, did not have a fabric amount on the back. I'm no good at estimating the amount of fabric needed. Here was this kimono-themed jacket. It's not lined and it's reasonably simple to assemble. There was a variation for contrasting trim. I liked the look of the pattern. Now, Pam was not around to talk me out of this purchase. I was running errands on this date; groceries, Target, JoAnn, cat food. Probably, both the pattern and the fabric will be around at the end of December, but I could make this and have it for my trip to Virginia at the end of November. I'm going to do the contrasting trim in black satin. I almost bought blanket edging, instead of the satin, but I wasn't sure how it would work around the neck. The pattern piece is curved to accommodate the neck line. Blanket satin is not. So, I am testament to the power of putting eye-catching items on the end of a row. The gal helping me liked this material as much as I did. I could see this as a vest with a quilted lining, since you can buy quilted fabric now. Add a gold shirt and a bow tie, topping the look off with a top hat and a cane, and you have a Halloween costume. I'd probably wear the vest year-round. I need to make room on the table in the living room to cut this out and get it made. We won't talk about the boxes of fabric in the closet.